For September, we are lighting things up with this beauty! This gorgeous design was custom made to ensure that the homeowners dream for a sleek finish and seamless design was met. During the day, you are really able to enjoy the infinity edge that waterfalls over the edge into the intracoastal. While at night, the unique LED lights add for a glowing finish. The deck is complete with travertine marble with a slightly elevated entry point to the deck to show one level from the deck into the actual pool. When you are viewing this pool from inside the home, there is one clean line from the deck to the intracoastal – which is unbelievably gorgeous! The tile selected to encompass the pool also ties back into the seamlessness of the design and at night as it blends right in. You are really able to enjoy the same pool, that looks completely different depending on the time of day. The pool is also updated with the latest remote system – Jandy iAqualink, computable with in-house automation and via mobile technology. This allows for extremely easy control of all settings and features that this pool showcases. The home also currently has a tiki hut located near the pool, which will be a great home for an outdoor kitchen. With views like this, we are sure that this family and their guests will be enjoying their backyard all year long. 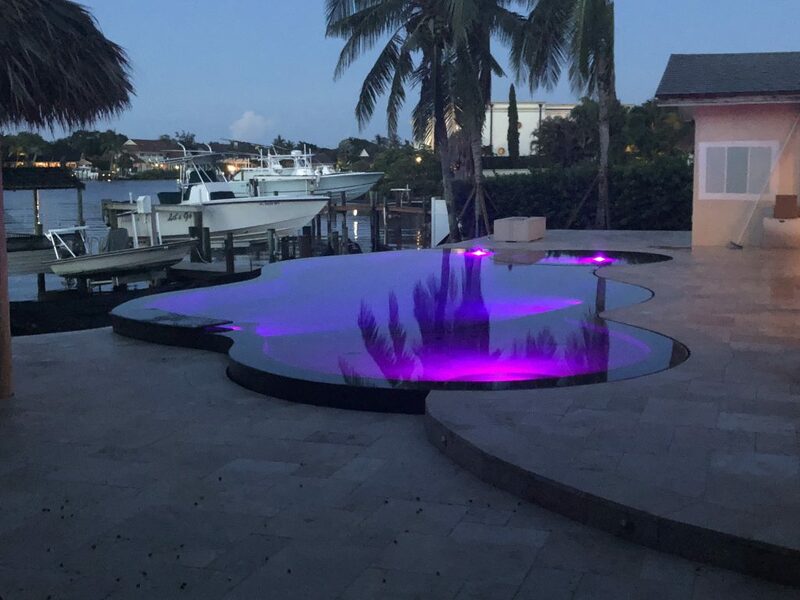 Curious to see how Treasure Pools can turn your backyard into this unreal sanctuary? Call today to set up a free consultation.